At the start line, nobody seemed to know exactly what they were getting into from here on out. 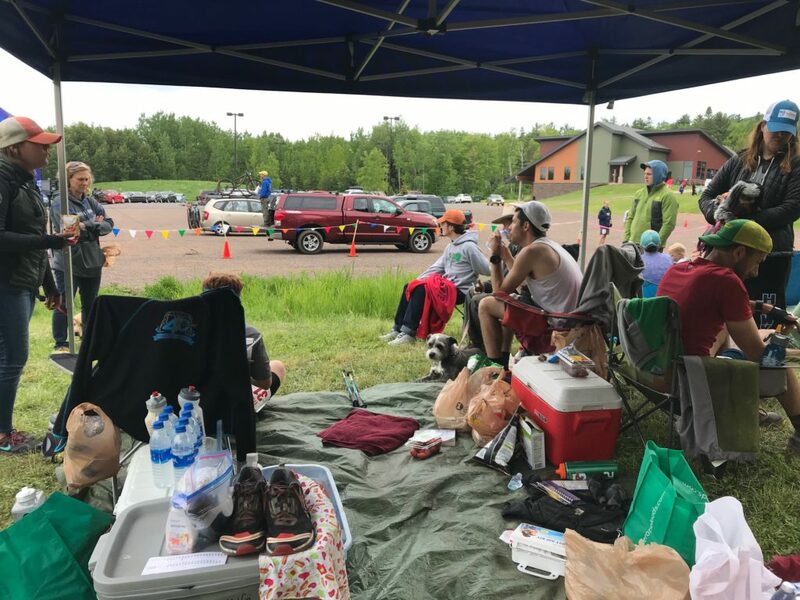 The Last Runner Standing in Duluth was a new race just launched in early 2018 and on June 9, 66 runners set out on lap one. I heard about the race and figured it’d be a good event to set my sights on. 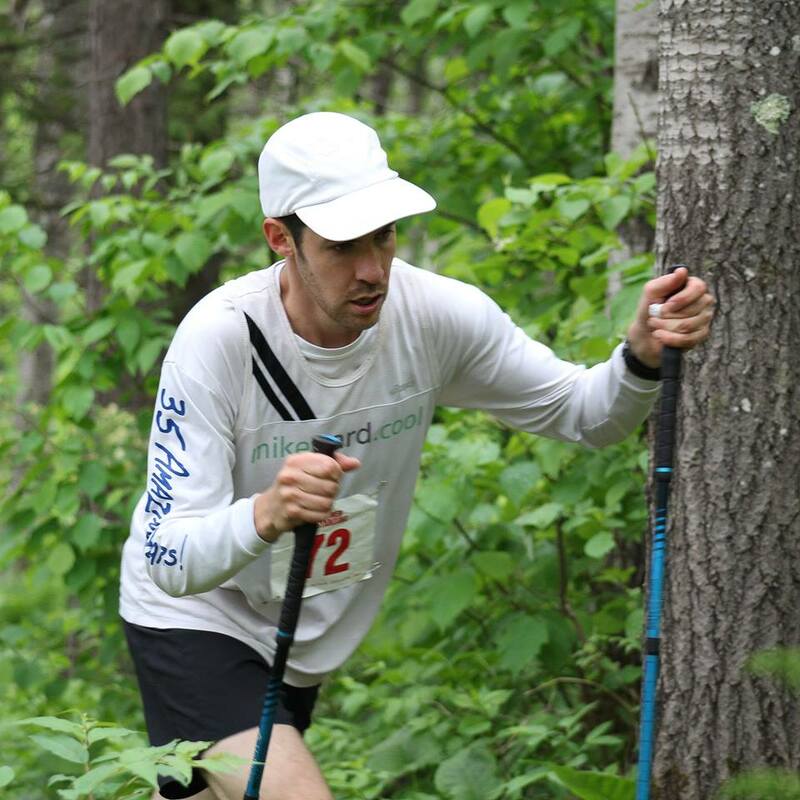 After Superior, I had no premonitions, no huge drive and nothing on the radar in terms of racing. That’s a freaky feeling… maybe I’m getting old? Maybe I’m becoming domesticated? Either way, it’s kind of funny not knowing how long, time or distance- wise, you should train for. I think my training suffered knowing that I only had to go 4.1 miles to finish. Here is some background on the Last Runner Standing event in the best way that I can describe it. 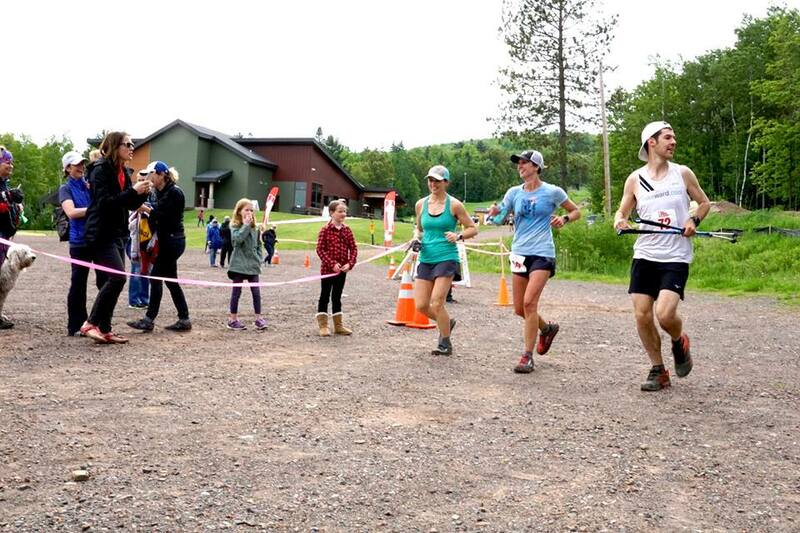 It took place at Spirit Mountain in Duluth and the race course is a 4.1666667 mile loop. That loop’s first mile is decently flat on a gravel road, essentially. 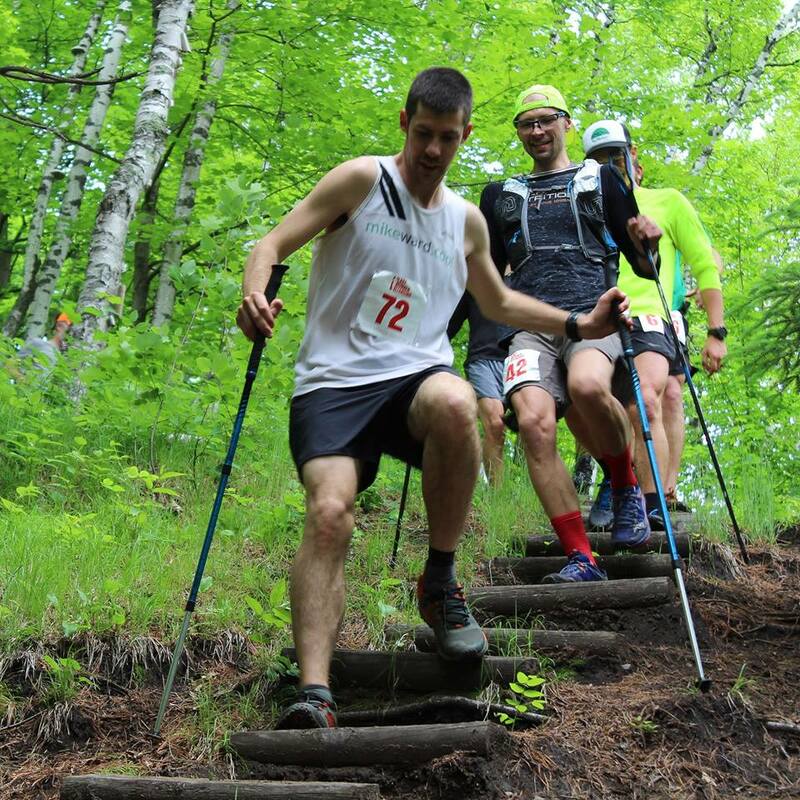 The next two miles are on Superior Hiking Trail singletrack, with a decent climb, a brutal stair downhill section, but pretty runable overall, with several stretches that are perfect singletrack trail running–slightly downhill or flat. That stuff is the best. The final mile is mostly on ATV/ski hill access roads. In that final mile, the first quarter mile is downhill. 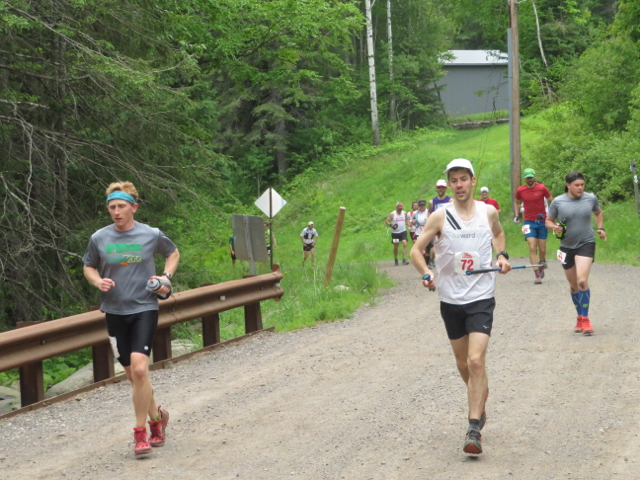 The second quarter mile is flat, and the last half mile of the loop is downhill. That whole mile is about 500 feet of descent, and the last half mile is about 400 feet of pure drop. I think that translates to about a 15% grade, and don’t have a great comparison, but the downhill got to be brutal after a while. So given that loop, the Last Runner Standing race is over once everyone quits besides one last runner who can complete the loop solo. The first race started at 10am, the second at 11am, and every other race at the top of the hour, every hour, until the winner is determined. 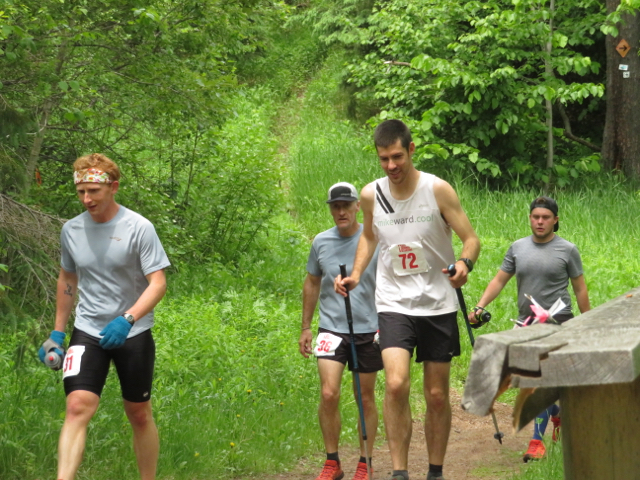 The overall pace is dictated at 14:24 minutes per mile, but the faster you run, the longer you get in the chair (or at the aid station, whatever you need to recover before the next top of the hour). 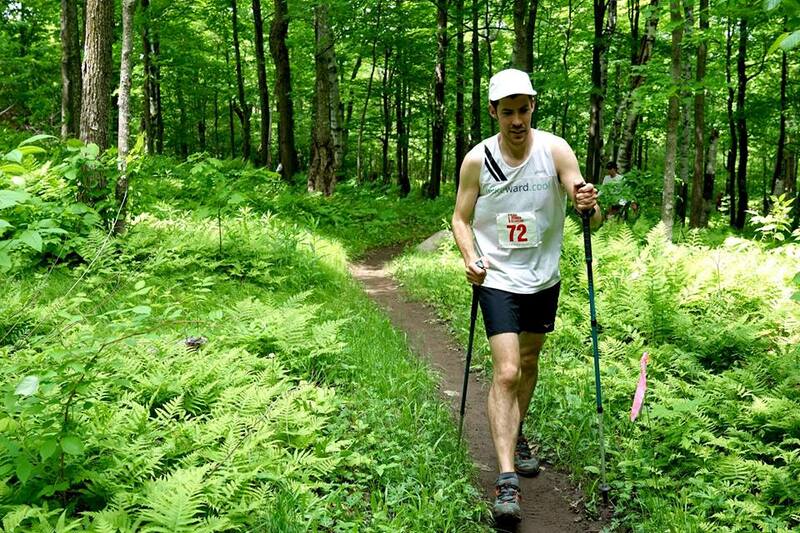 I trained for this race hoping to feel like I was in shape for 100 miles, and with that number in my mind. 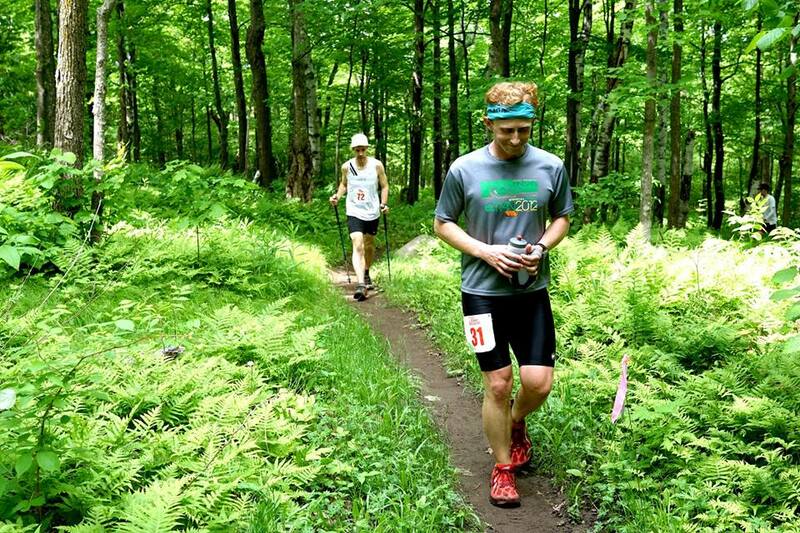 100 miles would translate to 24 loops, 24 hours, or running one last loop at 9am on Sunday morning. Training went OK but I didn’t feel like I was in shape I was for Superior 9 months prior. I packed up a ton of food: gels, gummies, fruit snacks, a lot of chips, ice cream, a few turkey wraps, cookies, fruit, gatorade, pop, and water. I brought a myriad of gear like handhelds, a waist belt, water bladders, hydration pack, hats, clothes, shoes and socks, rain gear, tents and chairs. There were serious doubts in my mind after my next door neighbor Pete and I ran the muddy course on Monday before the race and got a lay of the land. I figured it’d be very mentally strenuous to really make it far. Pete was signed up and ready to rock as well, and he requested to share a big pop-up 10×10 tent that I procured. I showed up to the race before 9am to set up and was happy to get a great spot. I started setting up and organizing and putzing and pacing around nervously. By 9, the parking lot at the bottom of Spirit was filling up and Pete arrived. With plenty of time to spare, I sat around and the pre-race meeting began around 9:50am. No surprises here, it was just an explanation of the course and rules. If you don’t make it back before the hour is up, you are eliminated. If you don’t start the race at the top of the hour, you are eliminated. Simple. We lined up at the start and finish line, and I was impressed by the amount of people. It was a hoard! Will this make it challenging?? Oh well, I figured that if I could make it a few laps with no mishaps people would start dropping out soon enough. 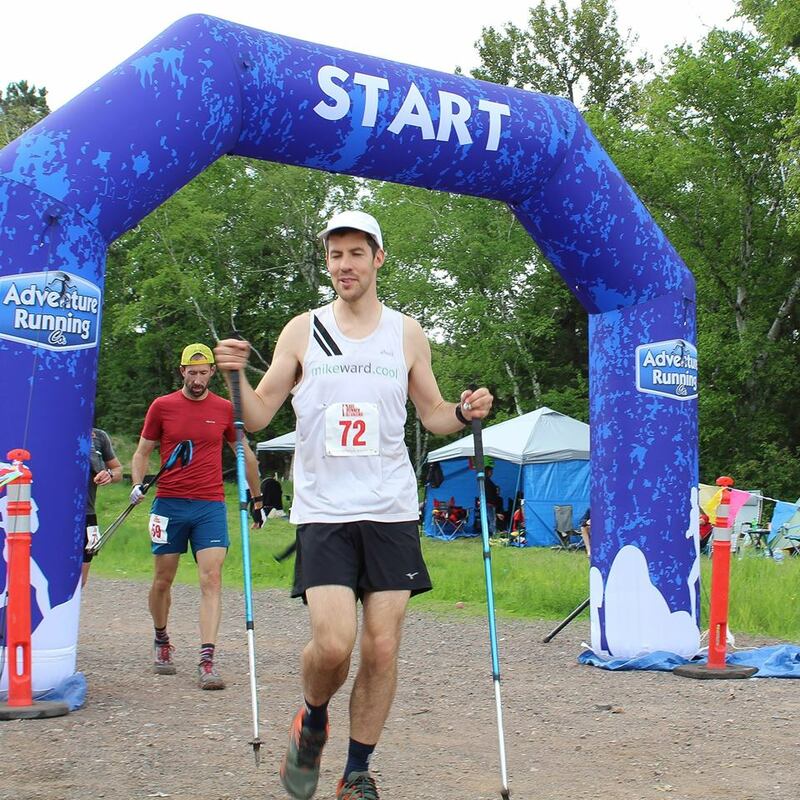 I had my trekking poles right away at lap one, and didn’t know what else to bring so kept my water and food and toilet paper and supplies at the home base. The race started with much excitement and at exactly 10am, we were off. 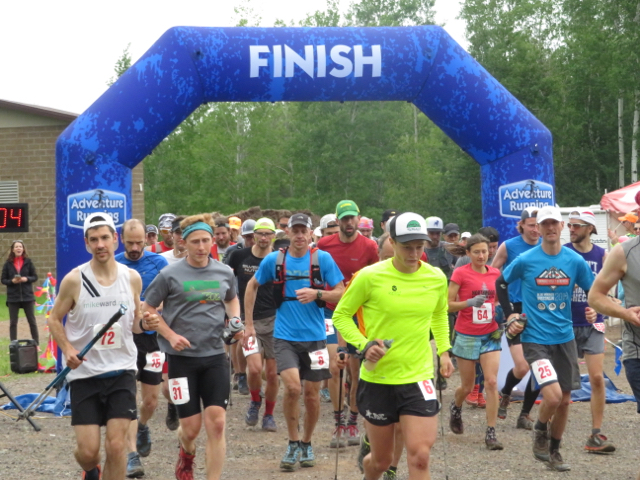 I snuck my way to the front and wanted to bank a little bit of time right at the beginning, knowing that it was runable and not wanting to get caught behind anybody. Everyone was talking to each other and sharing strategies and thoughts. I hit the first mile in 7:30. When we got to the singletrack, up it goes, and I walked. People clumped up behind me but nobody wanted to go around. Why would they?? The pace is dictated for us. I walked most of the singletrack, ran when I should, and walked the entire last downhill mile to get in around 46 minutes. It felt so easy and really no impact on the body. 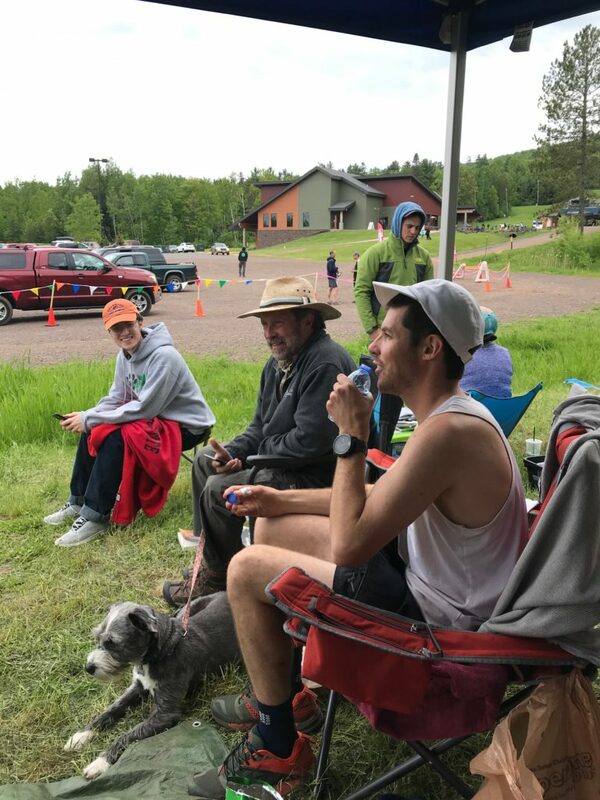 At the finish line, I went straight to my chair and ate anything that struck me as tasty, just trying to get a couple calories in, and chugged some water. There were ample announcements when it was 5 minutes, then 4, 3 minutes, 2 minutes and one minute until the next race was to begin. I moseyed out of my chair with a minute to go, an 8 second walk from the chair to the start line, and was ready for race two. My plan, which had been festering in my mind, was to rock 52-minute loops until 12 hours in, 50 miles, and hope to feel good. From there, let ‘er rip. See who’s left, get strategic and try to be the Last Runner Standing. I was a little fast on the first lap and wanted to slow down on the second loop. My first mile was slower, and tried to repeat my walking and running strategy. Walk the uphills, run when I should. I rejoined my neighbor Pete at mile 3.5 and we descended the first hill together back to the finish line, talking strategy. Walking down the big hill is probably smart, we thought. I mentioned I was unfortunately going to have to stop at the bathrooms between laps. Er, I said I was actually going to have to stop immediately. So I ran off in the woods with an upset stomach. The vegetation was high and coated in dew. 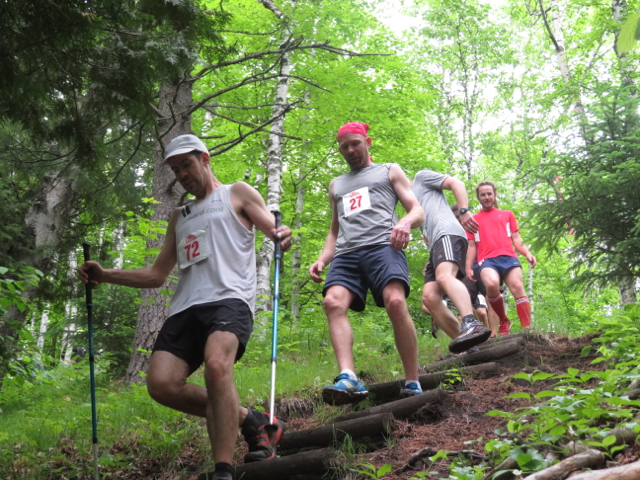 How unpleasant on lap two, to have to squat in the woods. As well, why does this keep happening to me?? Maybe it was the gel I ate that lap. I got a bit frustrated because I didn’t have TP on me. Leaves it is. I got up and ran the catwalk a quarter of a mile to the final downhill bomb, and into the finish line at around 11:50am. 50 minutes wan’t too bad given the emergency dump (e-dump). I kept running straight through the finish line to the porto-potties to clean up. I got back to my chair, ate a bit, drank and was ready to go for loop three. The next seven loops were straightforward. I became very familiar with the trail and was able to complete loops 4-9 in 52 minutes or very close to that minute-mark. Every hill or flat section, technical or runable stretch, was marked as either hike or run, and it almost seemed like I was taking the same footstep on every loop to get me exactly 52 minutes. What was also consistent was an upset stomach. I was having major issues. I could eat just fine, but my stomach was not sitting right and I made frequent stops. That caused some irritation in certain parts of my body, which was compounded by the friction of running. I was locked on my pace and strategy, but suffering. 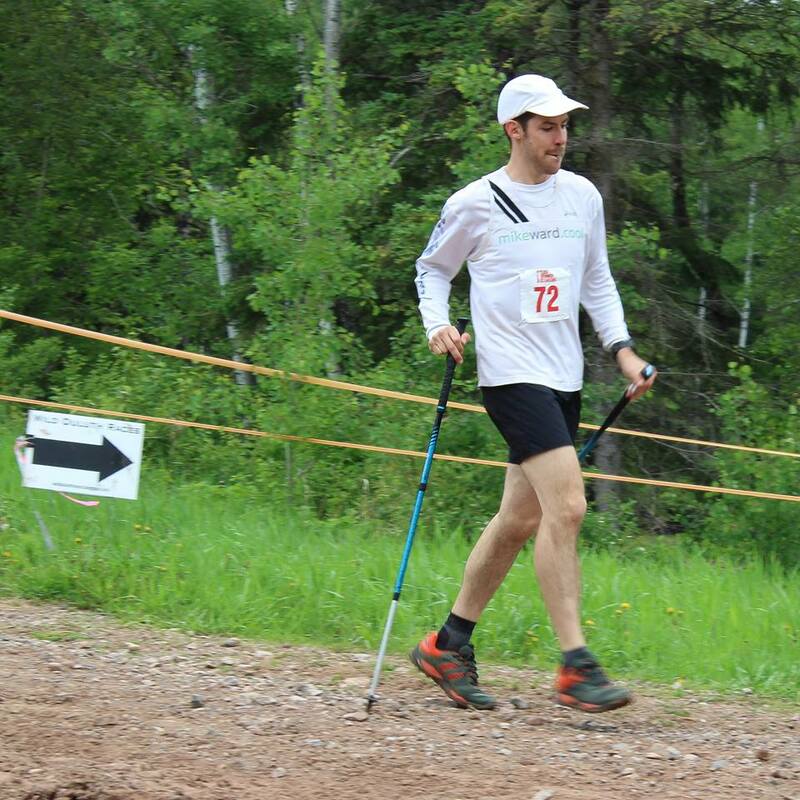 My legs were fine, fatigue was in check. Just as soon as I thought my stomach was settled, I’d nearly poop my pants the next loop. Terrible. Emily offered me an Imodium tablet, which is an anti-diarrheal pill. I reluctantly took one. She told me to take two. I told her I didn’t want to. I was scared it’d mess me up worse or make me uncomfortable. She told me to take the other one. I took it. Given the struggles of my digestive system, it wasn’t all bad. The conversation was great. It was so fun to run with the same people, or different people, chatting away, talking strategy, and hearing about people’s stories. 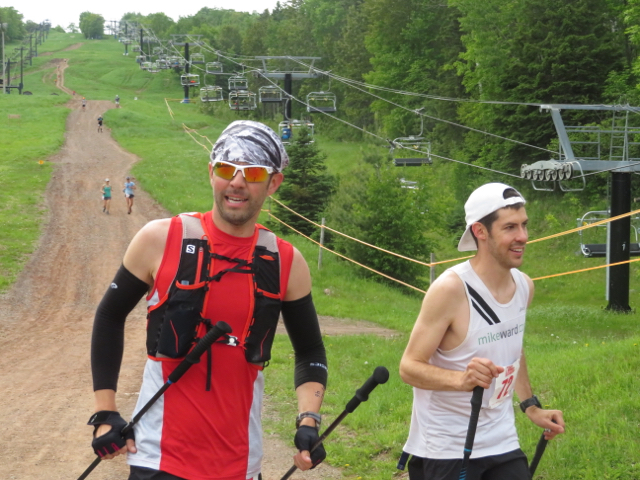 I ran with Ryan Wold, an ultra guy from Spicer. 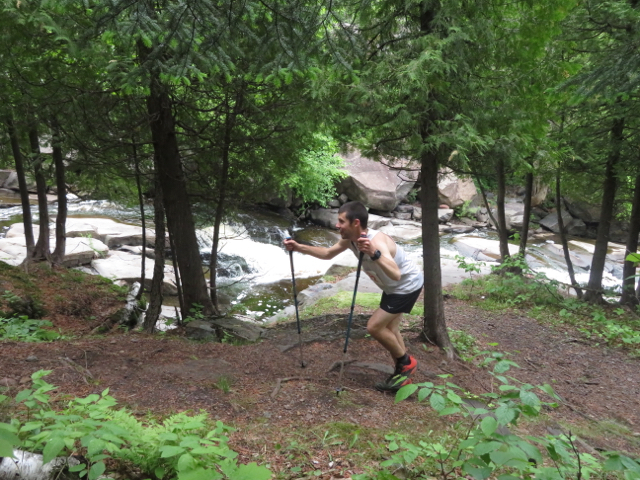 I did loops with my running buddy Dave Schuneman, who signed up on race week. I did laps with a local runner Marcus, and ran for hours and hours with my friend, next door neighbor, and tent-sharer Pete, totally unplanned and by chance. Funny how that works. I was chatting with a guy Mark from Iowa who has run an obscene amount of days in a row, and runs 11 miles a day, unquestionably. He was there to win, he said. He has what it takes because he runs 11 miles a day every day, and also said he’d rather die than lose. Umm, what. I was a little taken aback at that comment. I said out loud that the race will get gritty once it’s dark out. I kept telling people my prediction that past 10pm, people will start dropping quick. Would Mark be there? My other friends running with me?? On two consecutive laps, I found two pretty big agates. 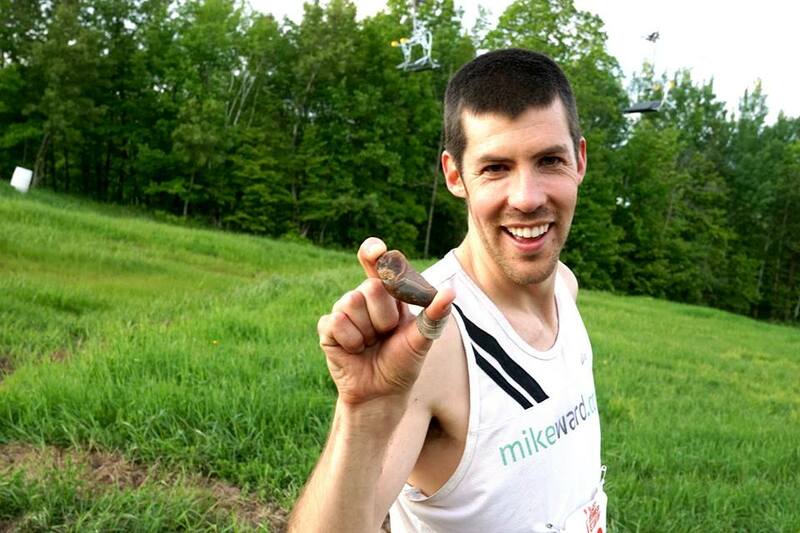 I was eating whatever food I wanted, fueling smartly and drinking plenty at the aid station. Then again, I barely carried water with me, and didn’t feel thirsty. 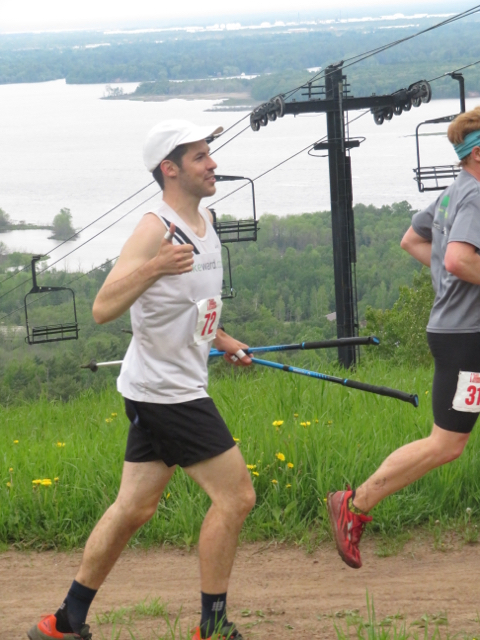 I ran with poles for at least the first nine loops. 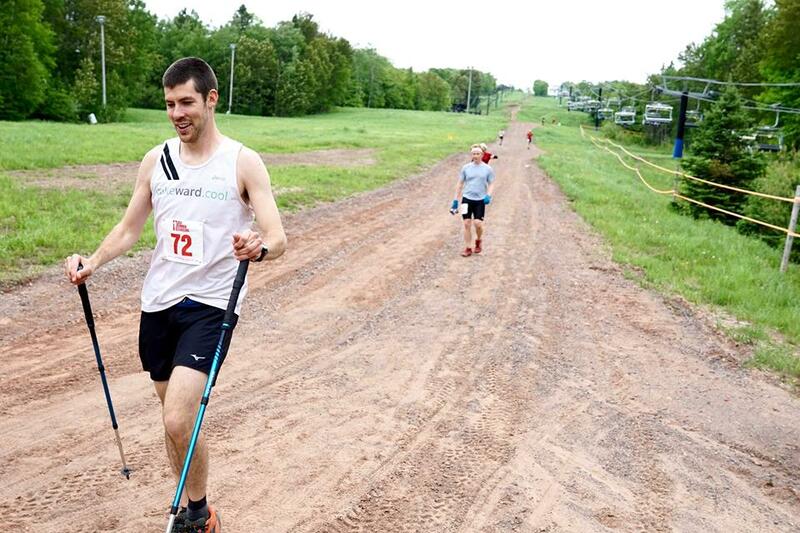 After lap nine, going onto my 50 mile benchmark, I told Emily that I wasn’t going to continue after this lap. I could do one more, but it was too hard, my loins were in pain, sick of my digestive system. I couldn’t even pee because I was too afraid that it would come out the back, too! The 40 miles were starting to get to me, I was tired. Yet I started and made the loop in 50 minutes or so… and could do another loop. Just one more loop, I could do just one more. The race director Andy said that at 9pm, loop 10, runners could have a “companion” during the night loops. I started pointing at my crew in the tent, Kyle jumped at the chance. He stripped off his hoodie and I changed my mind, telling him that he could come next loop. I started loop 10 with no poles, just to try. I ran the first few steps and chatted with Michael Borst, who was running every loop fast and looking really fresh still. He said this was just a training run and he was going to drop out at the first sign of fatigue, maybe after this loop or by 100k. There were maybe 20 or 25 runners still left going onto 50 miles. Definitely not a soft field. I ran fast with Mike, and kept going fast for some reason. It just felt good, and was so happy to stop and take a pee on the course. While doing that, I spotted one more agate, the best one of the bunch. That jacked me up. I came in around 46 minutes to complete 50 miles and picked up Kyle to run with me. At that point, I had my headlamp and it was officially dark. I didn’t really feel like talking so had Kyle tell me story. He didn’t really have any stories to tell, but we chatted away and the loop went quick. I told Kyle I didn’t need a pacer and I’m still not sure if he wanted to run more or not. He said he’d run 7 miles earlier that day… When we got back from loop 11, I was feeling good. I ate another slice of Pizza Luce pizza and was just grazing. Fizzy water was delicious and Emily was such a good crew person always making me drink. I wouldn’t have made it that far without her, no doubt. In the night, people started noticeable dropping off every lap. The field shrunk, and I could really start to see who I was up against. There were some hearty looking runners, Ryan was still in, Seth looked like a machine, and the Iowan Mark was looking really, really bad. 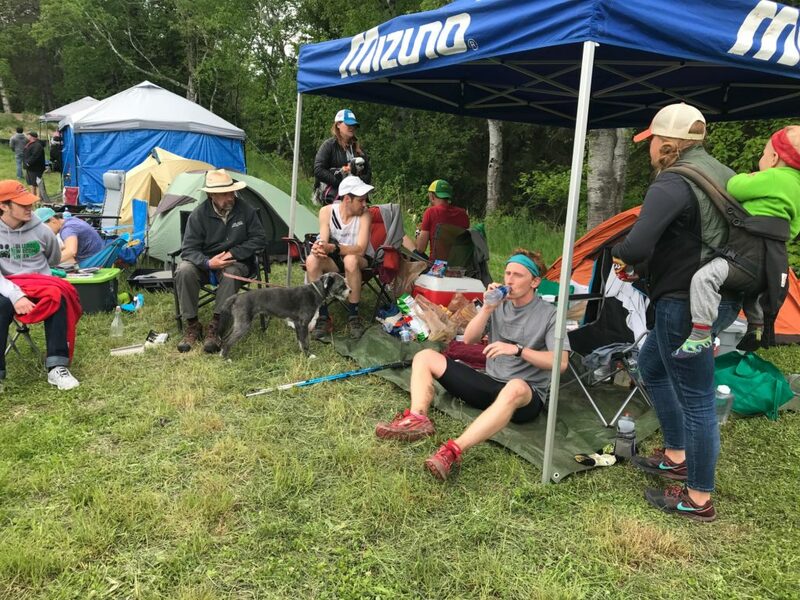 When he finished, even though he was very consistent at 51 minutes or so, he’d collapse into his crew’s arms and they’d ferry him to his tent. With a minute to go, they’d ferry him back out, one person on each side and blankets draped, and he’d start. That got some interesting looks from the race directors and medical staff. But he kept going. I was feeling really good, and started finishing each loop first. At the next milestone, 100k after loop 15, a couple more dropped out. It was down to me, Mark (who looked in really rough shape), and two other guys I hadn’t met or talked to. I didn’t know how anyone was running except they were all coming in consistently in the 50’s and I was still running for some reason, and coming in at 45 or 47 minutes. 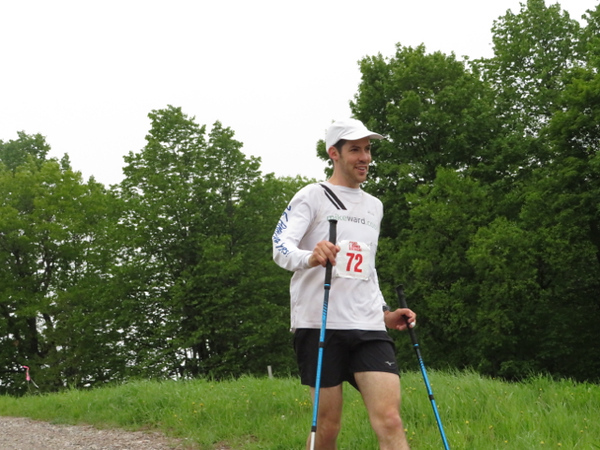 I was running uphill and running downhill. There were only a few sections where I was hiking. The last downhill plunge (dubbed “The Plunge”), was becoming more and more dreadful. The next loop, Mark came in with only one minute to spare. 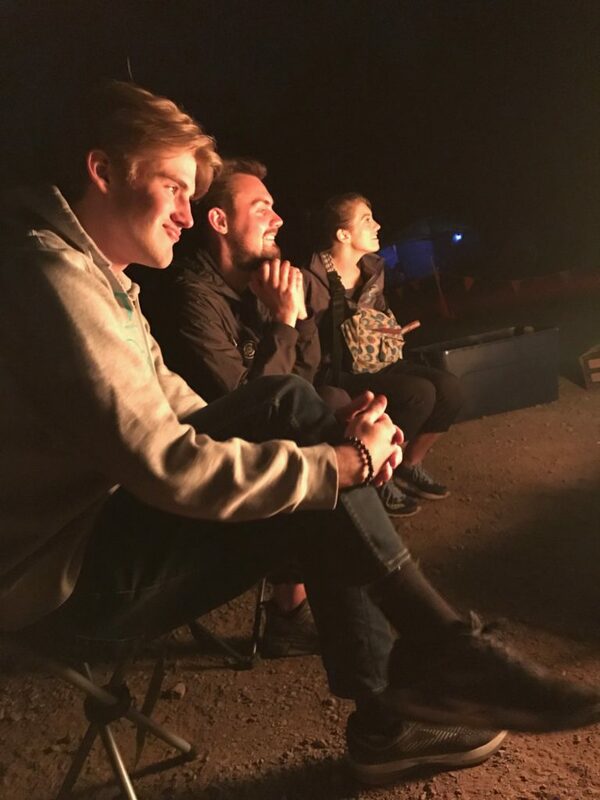 Emily and a few fans from Duluth Running Co. (Ian, Dayeton and Kyle) helped move the chair and food items to the fire because it was getting pretty cold in the early Sunday morning hours. We all four went out. Another fast loop. When I got back, I learned that Mark turned back. Down to three. I met Brandon one of the other runners still in the mix, and he and his dad Bruce had essentially set up camp around the campfire as well. Brandon was from Barnum. He’d requested fries from McDonalds and Bruce asked if I wanted anything. I told him that a double cheeseburger would be awesome. After the next loop, he had it. I ran that loop really fast, just feeling good. Perhaps it was the prospect of the burger. It tasted so good. We all three lined up for loop 18 and when four 0’s showed, 18:00:00, we went off. I had my trekking poles and didn’t run out of the gate. I was too tired. A few more steps and Brandon and the other runner Nick escaped into the night. I thought it may be my time. I stopped. I looked down at my feet and balanced on my poles. All the sudden, done. It was a weird feeling, but my legs just felt shot. Well, how much more shot are they now then when they felt shot 8 hours ago? I realized it was totally a mind game. I didn’t have it in me to continue. Or did I? I sat down, then laid down. I looked at the stars. I was looking for an excuse to turn back, and my excuse is that I’d sat down and laid down and looked at the stars and burned too much time. I couldn’t get up to run the rest of the loop within the hour! In hindsight, that would have been a better option. Instead, I turned around and walked back two minutes to the finish line. Andy ran up and asked if I was injured. I told him no, no, just too tired. The fire was so warm and welcoming, and I think Emily was a little relieved that I was done and she was done. I was relieved But I also know she was proud of my work, and I thought it was pretty cool that I made it 17 hours, over 70 miles, and to be one of the last three standing. Still, “third place” is the same as dropping after one loop, on paper, and it’s really nothing. Winning–to be the Last Runner Standing–is the one and only glory in this race. I rested for a bit, thanked Bruce for the burger. He joked that the laxatives that he put in the burger must have worked. I told him I didn’t even need that, based on how the day had gone. Me and Emily embarked on the grueling task of tearing down our home base at 3:20am and after a long, long day. It was nice once everything was packed back up, and we sat by the fire, admired the far away glint of the sky starting to turn the purple hue that is morning. We had to at least see how this 18th loop would pan out. Nick came in first, at about 3:51am. I told him it was down to two. He asked where Mike was. I said I was Mike. Brandon came in and looked as relieved as Emily and I, and I wished him luck as the local dude. It turned out that Brandon ran a couple minutes over an hour on loop 21. 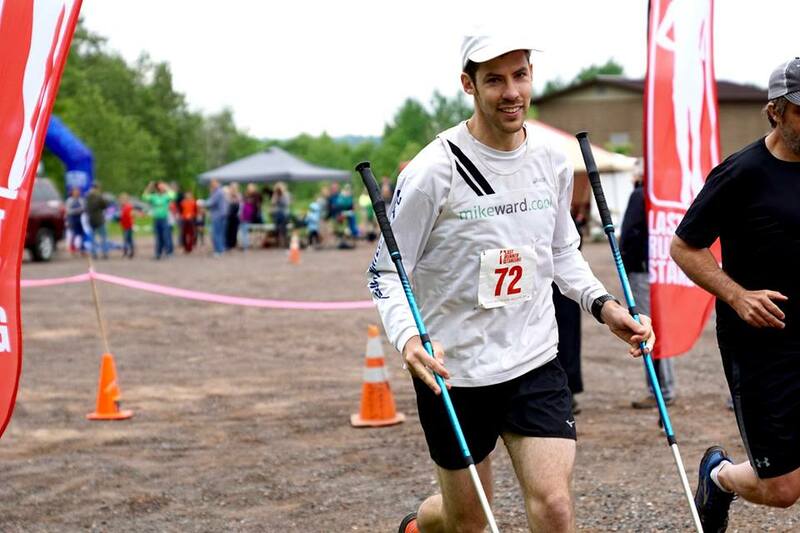 Nick started and finished loop 22 to become Last Runner Standing, clocking over 91 miles. They ran well into the sunlight of Sunday. It was a crazy race. I think everyone except Nick thought about how if they did this or did that, they would have run further. Everyone had a reason why they couldn’t run one more loop. My reason was bad, I just couldn’t do it. Brandon is a true beast for running until he was too slow to complete the loop in an hour. That is a good reason. I think this is true for any distance and amount of time, but I found Last Runner Standing to be hard physically, but very much harder mentally. Food and drink: Too much to list. Mostly Pizza Luce and fizzy water.